Chase Freedom® Credit Card lets you earn $100 cash back bonus when you spend $500 during the first 3 months of card membership. You'll also get 0% introductory APR on balance transfers and purchases for 15 months. Get 5% cash back on up to $1,500 for rotational categories and no annual fee. The Chase Freedom® Card is giving new cardholders the chance to earn $150 bonus cash back after you spend $500 on purchases in your first 3 months from account opening. You can earn even more cash back when you activate 5% cash back for different categories every quarter, up to $1,500 in total purchases per quarter. All other purchases earn 1% cash back. You can enjoy all of these cash back opportunities with no annual fee as well! The Chase Freedom® Card gives 5% cash back on up to $1,500 in total purchases (for a total of $75 in cash back rewards) in select quarterly rotating spending categories. See the Chase 5% cash back calendar for details. After you hit the quarterly spending cap, additional purchases in the 5% cash back categories earn an unlimited 1% cash back. In addition, all other purchases earn an unlimited 1% cash back. You must manually activate your 5% cash back spending categories before the 14th of the third month in the appropriate quarter. Once activated, your cash back earnings will be retroactively applied throughout the quarter. Redeem your Chase Ultimate Rewards® points for many options. These include a statement credit, a bank account deposit, many gift cards, or purchases through the Chase Ultimate Rewards® shopping portal. There’s no minimum to redeem and your cash back earnings never expire. Points are generally worth 1 cent apiece. However, if you have or are planning to apply for the Chase Sapphire Preferred® and/or the Chase Sapphire Reserve®, you can earn even more Chase Ultimate Rewards® points. With both Sapphire-branded cards, points are worth 1 cent apiece. But, if you redeem them for travel booked through Chase, the point value increases to 1.25 center per point with the Chase Sapphire Preferred® and 1.5 cents per point with the Chase Sapphire Reserve®. Cash Back Boost: With Cash Back Boost, you can earn bonus cash back on purchases made directly through Chase’s Ultimate Rewards portal or “Shop Through Chase.” Extra cash back earnings usually range from 1% to 5% on top of the unlimited 1% base cash back, but they can occasionally go up to or even exceed 10%. The Cash Back Boost offers frequently change. Thus, if you’re interested, sign up for email alerts to keep up with the deals. Purchase Perks: Chase’s Purchase Protection covers your new purchases for 120 days against damage or theft up to $500 per claim and $50,000 per account. Extended Warranty Protection extends the time period of the U.S. manufacturer’s warranty by an additional year, on eligible warranties of three years or less. Travel Perks: Sit back with the complimentary Rental Car Insurance when you decline the rental company’s insurance option and charge your entire rental to your Chase Freedom® Card. You’re automatically covered for theft and collision expenses in the U.S. and most international markets. Free Credit Score: Your Chase Freedom® Card gives you unlimited access to Credit Journey where you can see your credit score and more. It’s free, even if you are not a Chase customer. Plus, checking your score does not affect your credit. For new credit card owners with very good credit who are looking for a simple cash back card, the Chase Freedom® Card is definitely a great option. It delivers an excellent return on your spending and offers some nice cardholder perks as well. With an annual fee of $0 and generous cash-back rewards, the Chase Freedom Card is a good fit for both rewards rookies and cash-back connoisseurs. There’s also the Chase Ultimate Rewards portal, an online portal where you can redeem your rewards and earn up to 10% cash back when you shop through it. 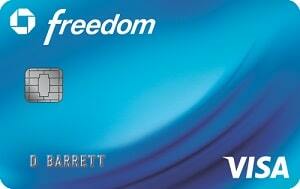 It’s easy to see why the Chase Freedom® Card is such a good option. Plus, when you combine it with the welcome offer of $150 bonus cash back, you’ll be even more motivated to apply. Don’t forget to check our the full list of credit card promotions!